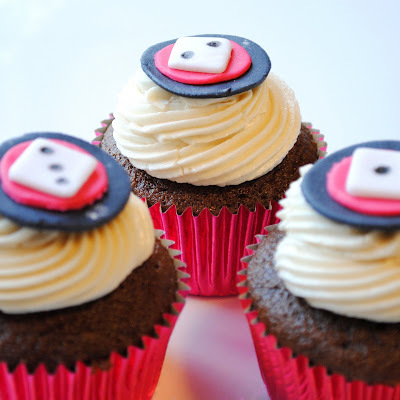 I also wanted to decorate the cupcakes with something "Las Vegas-y" so I made some little cupcake toppers with fondant. 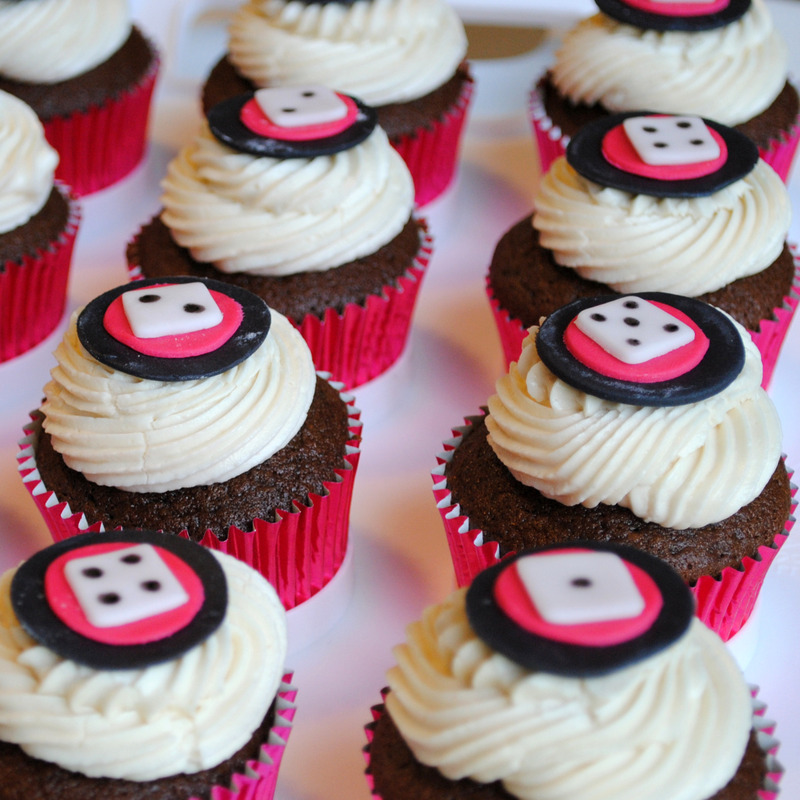 I layered circles of black and red fondant and then made little white fondant dice squares - adding the numbers with a black edible marker. I baked the cupcakes in red foil liners and overall, I thought they turned out really cute. Sift together flour, cocoa, baking soda, and salt and set aside. In a clean mixing bowl, beat egg whites until frothy with whisk attachment. Slowly add in sugar, beating until stiff peaks form. Set aside. Cream together butter and brown sugar until light and fluffy, about two minutes. Add egg yolks one at a time, beating after each addition. Measure coffee, vanilla and Kahlua and stir together in measuring cup. Add 1/3 of the flour mixture to the batter and mix on low speed until just incorporated. Add 1/2 the Kahlua mixture, mix until incorporated and repeat alternating flour and Kahlua, ending with flour mixture. Gently fold in egg whites. Fill cupcake liners 2/3 of the way full and bake approximately 20 minutes until a toothpick inserted in the center comes out clean. Cool about 10 minutes and transfer to wire racks to cool completely before frosting. Beat butter on medium speed until smooth. Add Bailey's and vanilla and mix until incorporated. Add powdered sugar, 2 cups at a time, mixing on low speed until frosting is the desired consistency. 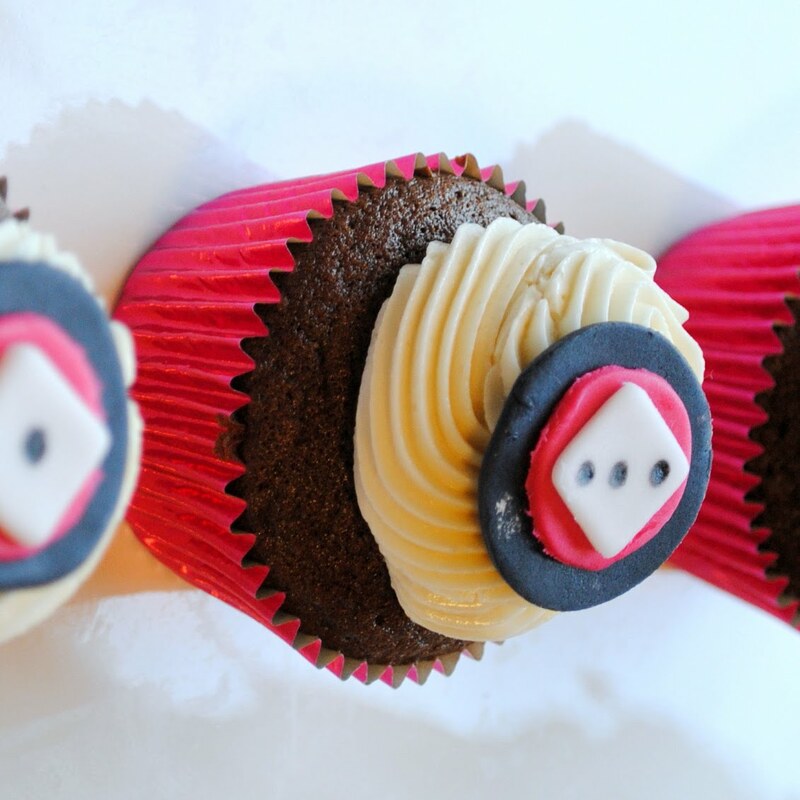 Pipe onto cupcakes as desired. I piped these with a large star tip. cute! What a great shower theme! I love the idea of a Mudslide cupcake. YUM! 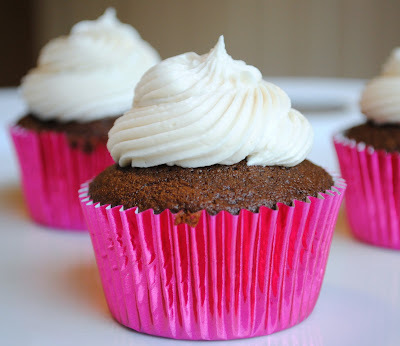 Ooooh, thanks so much for the link to my website after your GORGEOUS and oh-so-yummy Kahlua cupcake success. Great post! These look delicious!! I love the addition of the fondant!! Love the theme! Sounds and looks scrumptious, cool Vegas theme. These are so cute! Really professional looking! Thanks for your effort in sharing this recipe... so excited to make it.